The Rimutaka Forest Park Charitable Trust is a community project committed to protecting and restoring the unique flora and fauna of the Remutaka Forest Park located near New Zealand's capital city, Wellington. Remutaka Forest Park is a magnificent area of mostly native forest in the hills east of Wellington. It encompasses the Remutaka Ranges and the Orongorongo River, just north of the spectacular earthquake terraces and seal colony at the Turakirae Head Scientific Reserve. The Park is characterised by steep, bush-clad hills and narrow fern-filled valleys cut by abundant freshwater streams and the beautiful Orongorongo River. Throughout the park, there are many well-formed and signposted walking tracks appealing to bushwalkers and nature lovers of every age and state of fitness. Our "Restore the Dawn Chorus" project is now in its 17th year and our flagship "Kiwi Project" has produced a large number of beautiful baby kiwi chicks! NOTE: (April Kiwi Aversion Training Now Fully Booked, so we'll schedule another weekend in October or November, 2018). Another opportunity to get your dog(s) trained to avoid kiwi is coming up this month on the weekend of 28th and 29th of April 2018. Specialist aversion trainer, Jim Pottinger, will put your dog(s) through a series of kiwi sensory experiences in an outdoor setting and teach them to avoid kiwi encounters. Venue as usual will be the Catchpool Centre near the entrance to the Remutaka Forest Park down at the Catchpool. Bookings are essential - To do so, please contact Rosemary Thompson via email at kat@rimutakatrust.org.nz to express your interest - or to seek further details - so that an invitation with a time to book in with your dog(s) on your preferred day that weekend can be sent via email in the week before the training event. Kiwi chick, currently designated RFP48, being held by a staff member at the Pukaha Mt Bruce National Wildlife Centre hatchery soon after it hatched from its egg. Photo credit: Pukaha Mt Bruce. US Embassy (NZ) staff with visiting former Chief of United States Forest Service, Dale Bosworth and RFPT President, Geoff Cameron at the Catchpool Centre, Remutaka Forest Park. Chief Bosworth is in New Zealand on an official US State Department speaking tour, during which time he has visited many forestry-related organisations and research institutions. We were delighted that he came to visit us at the Catchpool on a somewhat damp Friday afternoon to learn more about our conservation-related community volunteer efforts - and to reminisce about forestry matters with another lifetime career forester, Geoff Cameron. Trust members with Hutt City Council Mayor, Ray Wallace, at the finalist's dinner for the Wellington Airport Regional Community Awards, 2017. Photo credit: Wellington Airport. Rimutaka Forest Park Trust volunteers won the Heritage & Environment award at the 2017 Hutt City Wellington Airport Regional Community Awards too. Well done team! The Heritage & Environment Award certificate presented to the Rimutaka Forest Park Trust at the Wellington Airport Regional Community Awards 2017. What's hidden down there in that deep, dark burrow? Here's a really good way to reveal all! Our resident electronics Wiz has done it again! This time around, Alan Thompson has created some hand-powered bird call stations to accompany our recently installed interpretive signs. Prototype #1 of the hand-cranked bird call station affixed to one of our new native bird information panels. Several improved versions are now deployed on appropriate panels displaying the birds that the calls on the player represent. Now that the Remutaka Forest Park has changed its name following the treaty settlement, the Trust's executive committee resolved to change our trust's operating name too. The new name, 'Remutaka Conservation Trust' also corrects the historic spelling mistake in 'Rimutaka' and more closely reflects the essential purpose of our activities and the primary direction of our volunteers' efforts in the forest park. This website has now been moved to a new Domain Name - 'remutaka.nz' and eventually all of our signage, collateral and email addresses etc., will be changed over to reflect the new name. In due course, our formal, registered incorporated society name (The Rimutaka Forest Park Charitable Trust Inc.) will be changed too. 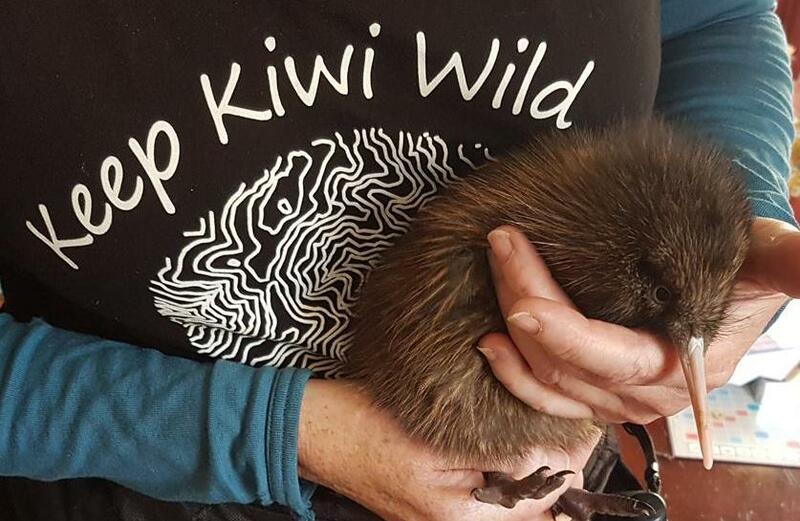 In any event, our Mission and Vision haven't changed - and we're still mad keen on Keeping Kiwi Wild in Wellington! A sweet surprise awaited our kiwi handling team when they raided kiwi Lorenzo's incubation burrow the other day. They were expecting to find one or two eggs somewhere between 50 and 70 days old, but instead were greeted by a chick that had already hatched, and another trying to bust out of the remaining egg! That explained some of the weird adult chick-timer transmitter messages we had been getting from Lorenzo this time around. Both egg and chick are now up at Pukaha Mt Bruce for safe-keeping, under the auspices of Operation Nest Egg and will be moved on from there to a kiwi creche until they're big enough to be returned to the Park for release into the wild. (Click for a larger image). Photo courtesy: Melody McLaughlin. One of our trappers, Andy Maloney, walked out via the Orongorongo Track after finishing his lengthy trapping run along the Whakanui Track yesterday, with a mind to photograph some of the splendid flowering rata throughout the park. He had left a bike at the Catchpool entrance so he could cycle back to his car in its normal parking spot at the top of Sunny Grove. After examining the images upon return, he was surprised and delighted to see a 'bonus' NZ Falcon had photo-bombed his photograph of a stunning Northern rata along the way! The cropped image appears above. What a stunner! (Click for a closer view). Rimutaka Forest Park Trust - Winners of the Regional Heritage & Environment Award at the 2017 Wellington Airport Regional Community Awards. We also won the Hutt City Regional Community Award for Heritage & Environment earlier this year. (See left column, below). Kiwi handler, Lianne Beckett tracked kiwi Manawanui to burrow with Kevin following the recent winter storms in Wellington. Photo credit: Kevin Alekna. Mr Baggins' Chick #2 is about to be brought back to the Remutaka Forest Park for release. See details below... Photo Credit: Tara Swan. North Island brown kiwi chicks will be returning to the Remutaka Forest Park, near Wellington on Saturday the 29th April as part of the Rimutaka Forest Park Trust's commitment to building a self-sustaining wild kiwi population in the Wellington region. The chicks have been hanging out at the Wairakei Sanctuary predator free Kiwi Creche, north of Taupo - gaining weight - and are now at the 1200 grams necessary to protect themselves from stoats. “Since the first birds were released in the Remutaka Forest Park in 2006 and 2009 the population has slowly increased to an estimated 120 birds calling the Southern Remutakas home. We are very excited as these chicks are second generation Remutaka birds, their parents having been born wild in the park” said kiwi project coordinator, Melody Mclaughlin. The success of the project has been made possible through the support of volunteers, sponsor and donors. Dedicated support of volunteer trappers and trap maintenance crew ensures the pest trapping operation is successfully maintained and continues to provide a safe haven for the birds to return to. “The support of sponsors and donors is invaluable ensuring we can continue to increase the population in the park. Two of these young birds will be named by people sponsoring their release” said sponsorship coordinator, Rosemary Thompson. There will be a blessing at the Wainuiomata Marae late Saturday afternoon; keep a look out for details and times on the Rimutaka Forest Park Facebook page www.facebook.com/rfptrust, Twitter, and this website: www.rimutakatrust.org.nz if you wish to be a part of this very special experience. "Hey Dad! There's someone at the burrow door!" One of Mr Baggin's chicks peeks out from beneath Dad when Jo Sim, kiwi handler, came to visit. Photo Credit: Jo Sim. Photo of one of the 7 new bird interpretation panels installed at the Catchpool Valley road end. These informative 2m tall signs assist visitors to recognise some of the many beautiful native birds present in the Remutaka Forest Park. (Click for more information). Photo credit: PC. To conclude last year’s shared celebration of National Parks, the Department of Conservation, the US Embassy, and Rimutaka Forest Park Charitable Trust unveiled a series of native bird information panels for the Catchpool Valley of the Remutaka Forest Park, near Wellington. The ceremony on Tuesday December 20 commenced with a blessing from representatives of the Wainuiomata Community Marae. The dedication and short welcoming remarks from the President of the Trust, Geoff Cameron, was followed by brief addresses by the US Embassy NZ's representative, Rob Tate and also from Department of Conservation representative, Jack Mace. The construction of the panels was made possible by a grant from the U.S. Embassy which then worked with the Trust on the design of the information panels about native bird species. “We are very grateful for the grant from the U.S. Embassy towards this natural history-environmental management project. It helps to celebrate 100 years of the U.S. National Parks Service in 2016 and helps New Zealanders learn about the native birds they are encountering in the Catchpool Valley,” says Geoff Cameron, President of the Rimutaka Forest Park Trust. Embassy Public Affairs Officer Rob Tate says that the shared year-long project to celebrate the importance of national parks and mark 100 years of the US National Park Service has been something the Embassy has been deeply committed to. “Working with DOC, various iwi, and environmental trusts we have taken part in a huge range of activities. We have done the traditional planting of trees, and also done things like assisting in monitoring native bird habitats and walking the Tongariro Alpine Crossing with Ambassador Gilbert. We brought out a US Park Service Ranger from Hawaii to share best practices with her New Zealand counterparts, and the Senior Advisor on Native American Affairs at the White House to discuss the role of indigenous peoples in stewardship of natural spaces. We hope that all of these projects will continue to bear fruit well into the future,” he says. “The team from the Rimutaka Forest Park Trust have been a delight to work with and it has been so rewarding to be involved in another project that will educate future generations about the importance of taking care of our natural heritage,” he adds.